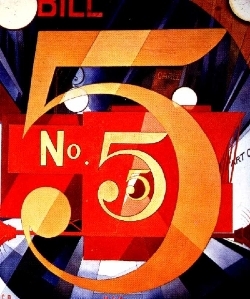 There are always five reasons to write a book. And to help the world may be on the list. But chances are it isn’t number one. I know one author for whom helping the world really is number one on his list. For the rest of us mixed-up mortals, I think contemplating our five reasons is a healthy exercise. What are your five reasons for writing the book you are writing now? Not what are the five reasons you’re not writing your book right now, that’s a different blog. And not five bad ones either. “So my parents will finally understand,” and “as a way of escaping my present life” are two that I had to grow out of, for example. Write them down and keep them close for the times when you lose your momentum. You don’t need all five for every writing session – one will do. I just think it’s important to have some idea why you’re doing what you’re doing. I guess that goes for life in general. It can be useful in case you encounter obstacles, rejection, or misunderstanding. Why am I doing this again? Five good ones total so you’ll know for sure – in this very subjective, relative endeavor – whether what you’ve done is as good as it gets. I still have a few monkeys on my back, so don’t get too jealous. Besides, when I got published, it wasn’t like I joined some secret club. You’ve likely heard the tales: one book pays for the other six, they don’t put any money into promotion, and so forth. While I relished that seal of approval on the spine, and leaning on their expertise as mine grew, I was the one who set up all twenty spots on my book tour that first year. For the most part, it’s been great. I’ve now completed 70 tour dates throughout North America in the past three-plus years. But no matter how exciting life post-publication has been, it has never gotten better than those champion writing sessions where I was achieving the height of my flight. When someone says, “Your books are so original; I have learned more from you than anyone else” — I am happy, of course — but it is like I am hearing about a trip they’ve taken when I got left home. So my point is that we need to take writing and separate it from publishing. My third book on writing comes out today but I also have an unpublished novel and an unproduced play. What writing has done for me exists outside of what has been published, and far exceeds it in value. There are things we do because we are called to do them, and that is what we can control. We can’t control fate. In Buddhist iconography the person is represented by a little wheel and the universe by a big wheel; when their teeth link up and they turn together, that is when you get your “15 minutes of fame” as Andy Warhol might have said… And then the big Wheel of Fortune spins on, and it may be a long time until you are linked up again. So what are we supposed to do with all that lonely empty wheel space in the meantime? Live in the Glory Days? Feel like an impostor? Worry about the future? Try to chase the market and write something that meets current popular trends? While we are waiting for the little wheel to intersect with the big wheel, we get distracted from what is really important in our own development. Like, what is the best thing I could be writing right now? What have I learned so far about writing that can help me reach my next goal? How much time can I find to pursue my passion of writing? How can I let that passion change me? What kind of excuses do I need to find for the people in my life to explain what I am doing? How can I commit to the lifelong process of finding myself as a writer? What trips do I need to take? What people do I need to meet? What research do I need to do? What music do I need to listen to? What kind of community do I need to join, or create? Earlier in the cigar story I referenced those people who inspired me in my current project. Some are editors, some are beta readers. Some are just people who make sense every time they speak. I call them my team, and put their names in the Acknowledgments section of the new book. Some of them are surprised. “What am I doing here?” they ask. “It’s a long story…” I say. Basically, you’re there because you helped me not quit. That’s the best thing you could have done for me. 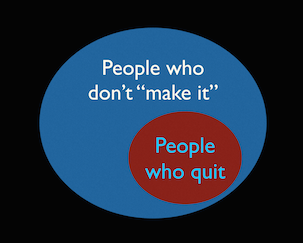 I once drew this Venn diagram which shows how, of the people who don’t “make it,” all of the people who quit are contained completely in there. I think that a lot of the reasons people don’t finish is because they don’t have a structured process to know what they need to be working on, when. That’s a pretty innocent way of getting lost that hopefully this book has helped a little with. Some people don’t finish because they can’t keep the publication wolves at bay. Daydreams about acceptance, and the converse, anxiety attacks about rejection, and not going to help you finish. Sometimes, this pressure from the outside world gets too intense, or sometimes people can’t bring themselves to put themselves out there as the author of this book. They may have what are called hidden, related commitments—something just as strong or stronger that is working against them being a successful, published author. Whether you want to get really deep about it, or just say, “I can’t seem to find the time…” there is one thing I want to say that will seem pretty obvious. The people who quit, can’t make it. Finishing requires tenacity. Taking something all the way to the end always looks kind of insane. Of course, it won’t feel insane. It will feel indescribably satisfying. If you are a writer with a product or a service to sell, you probably know the value of guest blogging at other online sites to get exposure to new readers/customers. We call that doing a blog tour. But I would like to pause for a moment and give a shout-out to the other tour, what is now called the “offline tour,” the old fashioned roadtrip-type book tour. That was the first, and in many ways is still the best, tour: the actual tour.